Bruce Thurlow, Florence Maguire and Mary Pickard represent the Scarborough Historical Society partner. They have brought a unique blend of experiences to the Scarborough team: teacher, school administrator, psychologist, lobsterman, O.R. nurse, school nurse, editor, sales administrator, event planner and regulatory affairs specialist. Other interests are just as varied: conservation, boating and boating education, gardening, politics, and community service. 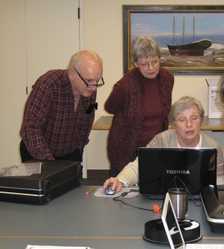 They became involved with the Maine Community Heritage Project because of a mutual fascination with the history of Scarborough and the opportunity to share their interests via a collaborative effort with the Scarborough Middle School and the Scarborough Public Library. The result of this collaboration is a "virtual Scarborough Room" on the Maine Memory Network. The Scarborough Historical Society was established in 1961 to protect the rich history, heritage and traditions of Scarborough. Its mission is to share this history with the community by collecting, preserving and displaying materials associated with the past. Staffed totally by dedicated volunteers, the museum is open Tuesday mornings from 9:00 AM to noon and by appointment all year round. The Society provides a variety of services to the community. Students at all levels consult the museum staff regarding research resources for history projects. Every autumn, as part of their studies of local history, Scarborough third grade classes visit the museum for a morning of hands-on activities and discussion of displayed artifacts. From September to May the Scarborough Historical Society's monthly programs, usually relating to some aspect of local history, are open to the public.